The Month of March is here bringing Spring and, most importantly, Spring Break! You’ve scoped out the best beaches, bought a new bathing suit, booked the flight; now it’s time to relax on the beach and hit up the dance clubs with your besties. But how do you pack everything into one carry-on to avoid the dreaded baggage claim line? What are the essentials to make sure you fly in comfort, relax with music and have enough battery power to post your selfies on Instagram? Eden Goldberg,VP of Marketing at InMotion Entertainment Group, and self-proclaimed travel guru has compiled a guide that will take the guesswork away for you and your friends preparing for Spring Break. That’s right, it starts with a great suitcase. I prefer a hard shell version, such as the Samsonite Winfield 2 suitcase. It is great looking, deceptively lightweight, sturdy and spacious and fits in the overhead storage. 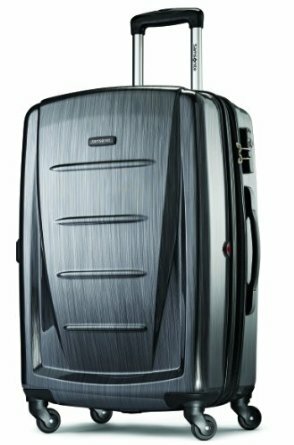 It offers a retractable handle and 4 multi-directional wheels, so you can easily maneuver in a crowded airport or city street. As far as clothing, I have a basic uniform comprised of two pairs of shoes, two pairs of pants, a lightweight dress and a complimenting sweater or blazer. If I am travelling somewhere cold, I always wear the heavier items on the plane. I can dress the basics up with my tops and accessories. I always pack workout clothes to reduce my excuses! My #1 rule: I only pack clothing that coordinates with everything else in my bag. Since delays and unforeseen schedule changes do happen, I pack one extra top. I always have my toiletry bag packed with TSA approved sizes of my everyday essentials. As soon as I return, I refill any product I’ve used, so I can always grab and go at a moment’s notice. To maximize space, I lay sneakers & shoes on the bottom, along with my already packed toiletry bag. I fill in the spaces with my undergarments and pajamas. Despite all the “better packing options out there”, I take my hanging clothes with their hangers and fold them neatly right on top. This way, I unpack as easily as I pack. I then lay my sweater, any documents and accessories right on top. Most flights allow for one carry on bag and one personal item, so I generally carry a small backpack or tote, which holds a lot more than a purse. I like the Speck backpack – it is a modern design and offers comprehensive organization compartments that keep everything neat. It also fits easily under the seat in front of me, so I can access anything I may need in route. I also have a pre-packed “charger and battery” pouch, with my mophie case, Ventev cables, Moshi wall adapter, and MyCharge Talk and Charge. As far as I am concerned, cat naps while traveling are essential! I swear by my Cabeau Evolution Cool neck pillow. It is compact, reducing down to ¼ of its size, and made of super comfy, responsive memory foam. Because it has a waterproof case I can even bring it to the beach and the cooling air circulation vents are perfect when I’m laying in the sun. Added bonus? A set of memory foam ear plugs are included. No matter what the temperature is at my destination, I always wear a scarf, such as an oversized 360Cashmere wrap. I use it as a blanket to keep cozy on the plane, and can also layer over a dress for cooler nights out.